The Russian airbase Hmeymim in Latakia is preparing to celebrate WWII Victory Day. Marking the anniversary comes after more than six months of air strikes in Syria which some claim helped tip the balance of the civil war in favour of the regime’s army. Since the announcement of the partial cessation of hostilities in February, the base became Russia’s centre of ceasefire monitoring that works to advance the truce in some of the most turbulent areas of Syria, including Aleppo. “There’s an understanding of the need to achieve at least a short-term regime of quiet to revive, in some way the process of reconciliation. But currently it’s being undermined in various ways by the terrorist group, the al-Qaeda-affiliated al-Nusra Front which is very active in that region,” Igor Konashenkov, spokesman for the Russian Defense Ministry told Euronews. 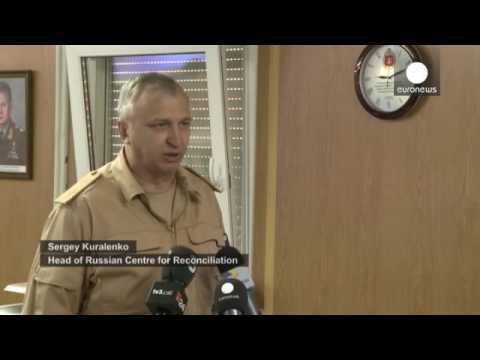 The so-called “Reconciliation Centre” in communication with its American counterpart gathers data on ceasefire violations which, according to this data, became significantly less frequent since the ceasefire began. Though reports of fighting and casualties continue to make headlines. “The centre’s employees work directly at the line of contact between the warring parties. They carry out personal observation, and collect information from the government troops and from citizens. Here, at the centre, they monitor social media and other media. We exchange information with the US, and receive data from Russia which we process. So we have full information on everything that happens in Syria,” said Sergey Kuralenko, Head of Russia Reconciliation Centre in Syria. Despite the diplomatic efforts, the latest attempt to revive the ceasefire in Aleppo has failed with new episodes of violence in Syria’s “northern capital”. It’s reported nearly 300 people have died in the past two weeks as pro-government forces and rebels battled for control of the city. The government blames the Islamist al-Nusra Front that holds control over parts of the province. “In Aleppo, the situation is very poor because the al-Nusra Front do not want peace. The group neither wants peace or security in the country, or in the city because it is close to the Turkish-Syrian border and Turkey does not want peace in Syria. It is Turkey which is behind the problem in Syria. It supports the al-Nusra Front and terrorist organisations like ISIL. It gives them weapons and opens its borders. Similarly Saudi Arabia does not want peace in Syria while we, we really want peace and the Syrian people want this war to end,” claimed Hussam Maalla, General, Syrian Military Intelligence Directorate. Euronews filmed on the air base invited as a part of a media facility in Syria provided by the Russian MInistry of Defence. Our reporting was not subject to any military control. The Russian command says the numbers of sorties at the airbase have fallen tenfold since the ceasefire. Military officials say just 30 warplanes and helicopters returned to Russia. They did not reveal the exact number of those remaining.